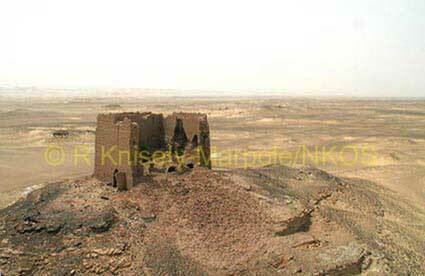 Qasr el-Gib is the northernmost fort of the entire oasis. Located on a natural knoll commanding a view of several kilometres all around, it acted as a beacon to travellers arriving in Kharga from the north. Sturdily built of large sandy mud bricks, it originally stood to three storeys in height and inside was tightly packed with rooms. The only entrance was located to the south, perhaps as defence against the northern winds of the oasis. Despite the crenellated profile of the wall and the four round buttresses around its corners, Ain Gib was rather small and may have been constructed with an eye to impressing people, rather than as a viably defensible building.